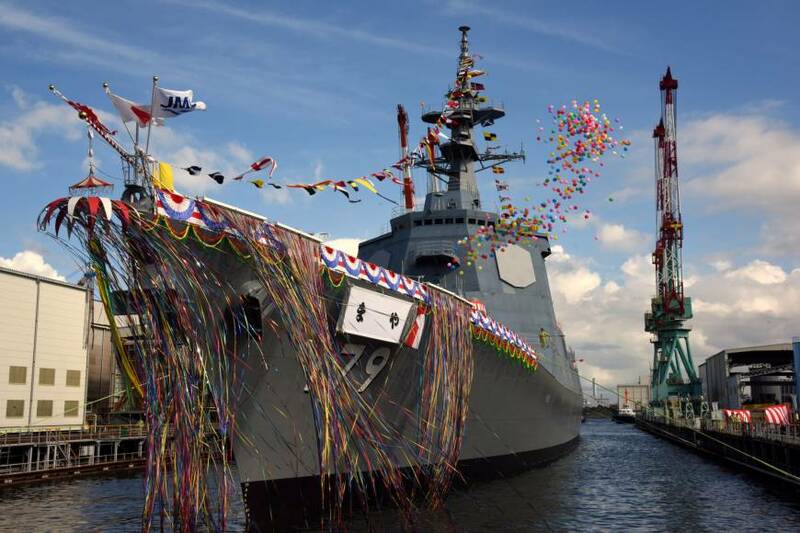 According to the Japan Times, a launching ceremony for an 8,200-ton, 169.9-meter/558-foot warship for the Maritime Self-Defense Force (MSDF) was held Monday, July 30, 2018, at a plant in Yokohama’s Isogo Ward as Tokyo keeps steadily bolstering its defense capability against North Korean and Chinese missiles in close cooperation with U.S. military forces. The Maya-class Aegis destroyer, which is yet to be furnished with major weapons systems, will be handed over to the MSDF in March 2020. Defense officials have pinned great hopes on it. When deployed, the destroyer – built on the back of a ¥164.8 billion ($1.5 billion) budget for the ship and its weapon systems – will be one of Japan’s most powerful naval ships, boasting the latest version of the state-of-the-art Aegis combat system, which can be closely linked to the U.S. naval combat network. Aegis consists of powerful computers, radars and missile-launching systems capable of tracking dozens of targets simultaneously and firing a number of missiles at once. The ship will boast the latest version of the system, which can fire powerful Standard Missile-3 (SM-3) Block IIA missiles capable of intercepting much faster ballistic missiles – such as those test-fired by North Korea in a steep lofted trajectory into the Sea of Japan last year. On June 12, North Korean leader Kim Jong Un met U.S. President Donald Trump and agreed to the denuclearization of the Korean Peninsula. Trump has praised the agreement and even declared that North Korea is no longer a nuclear threat. But Japanese defense officials have remained deeply skeptical, maintaining plans to build two new Maya-class destroyers and even set up Aegis Ashore ballistic missile defense systems in Akita and Yamaguchi prefectures. «We cannot avert our eyes from the harsh fact that several hundred ballistic missiles whose range covers our country still exist in reality», the Defense Ministry said in a letter to the Akita Prefectural Government on July 19. Japan is building another Maya-class destroyer and also upgrading the Aegis system of two Atago-class destroyers. In total, Japan will have eight Aegis destroyers with ballistic missile defense capability by 2021, four of which will be capable of launching SM-3 Block IIA missiles. Japan has decided to build Maya-class Aegis destroyers because in recent years North Korea started test-firing ballistic missiles into the sea around Japan without any advance signs, said retired Vice Adm. Toshiyuki Ito, now a professor of innovation management at KIT Toranomon Graduate School in Tokyo and a former MSDF commandant of the Kure District. «In the past, the MSDF used to send Aegis destroyers (to monitor missile flights) only after it found some signs», of possible test-firing by North Korea, Ito said. «But the North started repeatedly test-firing missiles without any advance signs. So, the MSDF now needs to regularly deploy two Aegis destroyers», in the sea around Japan. Additional ships also are necessary because any warship needs to be regularly checked and repaired at a dock for a certain period of time, and crew members need to undergo re-training afterward. The MSDF currently finds it difficult to send Aegis destroyers on other key missions, such as multinational naval drills and operations to keep Chinese ships in check near the Senkaku Islands in the East China Sea, Ito said. The disputed islands are known in China as the Diaoyu. In public, defense officials often emphasize that the SM-3 Block IIA would be effective in defending Japan from North Korean missiles, in particular those flying at a faster speed in a lofted trajectory. But Ito believes the introduction of the latest Aegis system will also help the Defense Ministry to achieve a more important but less-publicized goal: strengthening the Japan-U.S. military alliance. The upgraded Aegis system set to be equipped on the Maya-class destroyer can easily be connected to and integrated with U.S. naval missile defense systems. The Maya-class destroyers are now set to be equipped with Cooperative Engagement Capability, a U.S.-made real-time sensor network system that will allow the Japanese warships to closely share radar and fire-controlling data with the U.S. navy. The new combat system can even launch SM-6 anti-air missiles, which are said to be able to intercept powerful cruise missiles recently developed by China, Ito said. This chance to significantly strengthen Japan-U.S. deterrence power against China is another potential value of the Maya-class Aegis destroyers, he said. On Sunday, the English version of the nationalistic, state-run Chinese newspaper the Global Times carried an article criticizing the Maya-class destroyer for «potentially targeting China and threatening other countries», quoting comments from a Chinese expert. With regards to the threat from North Korea, the SM-3 Block IIA missiles boast more powerful rockets and can fly faster than the earlier SM-3 missiles currently owned by Japan, and they will allow Japan to intercept North Korean missiles at an earlier stage, according to the Defense Ministry. They would also be useful in intercepting North Korean ballistic missiles flying on a normal trajectory to attack Guam, a key U.S. military base in the Pacific Ocean, Ito said. Thus, the introduction of the new Aegis system can have «very symbolic meaning» with regards to strengthening Japan-U.S. military cooperation, Ito said, «but I don’t think the Defense Ministry is willing to openly talk about it». For Japan to intercept a ballistic missile flying toward a U.S. military base overseas, it would need to exercise the right of collective self-defense – the right to attack a country attacking an ally. In 2014, Prime Minister Shinzo Abe revised the government’s long-standing interpretation of the pacifist Constitution and now argues that Japan is allowed to exercise this right if the nation’s «survival» is at stake. But this has been controversial and defending a U.S. military base overseas is still a politically sensitive issue. Ito doesn’t believe North Korea would likely attack Japan with a ballistic missile flying in a lofted trajectory. It is difficult to control a missile taking such a path, and its warhead could burn up while falling toward the ground at high speed, he said. When North Korea fired long-range ballistic missiles into the Sea of Japan using a lofted trajectory last year, that was simply because the North doesn’t have a testing area wide enough for long-range ballistic missiles, Ito argued.